Tick the Downloadable checkbox. After ticking this box, other options appear: Downloadable Files, Download Limit, Download Expiry, Download Type. 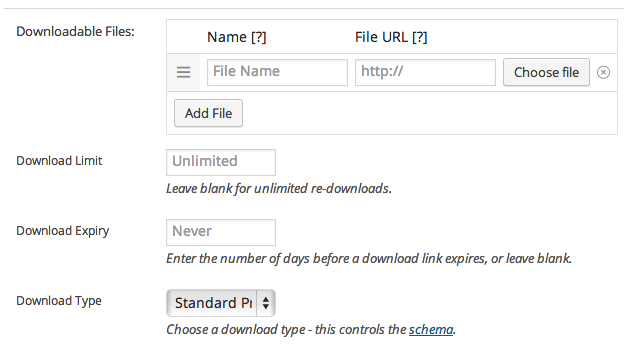 If you’re using WooCommerce 2.6.x and below, and you edit or add a new download to a file, past orders are granted permission to the download and the expiry date and downloads remaining are reset (since they are technically new files). Editing a download file row (changing the name, file URL or both) updates the download links on past purchases, but it leaves the expiry date and downloads remaining in tact. Adding a new download does not affect past orders. Only new purchasers gain permission to download it. If you have products that grant ‘lifetime access’ or similar to all downloads added to a product, a subscription or membership may be more appropriate. You can also combine files into a single archive (zip). If you want to restore previous functionality, there is a plugin available here. When setting up your downloadable product, ensure that the downloadable file settings use the same URL formatting that your site does. Make sure that it matches the site URL in your WordPress settings. (i.e. if www is in your site URL, it needs to be in the file URL). If you are using PayPal, there is a delay when using the IPN to track payments. You can instead enable Payment Data Transfer (PDT) by going to gateway settings and selecting it as the PayPal Identity Token. Payment Data Transfer (PDT) is a notification service that, once activated, can send transaction-related information immediately to merchants who are using PayPal payment buttons (PayPal Payments Standard). Merchants can display these transaction details on their website to confirm the buyer’s payment was successful. You can enable PDT in your PayPal account under Profile > Profile and Settings > My Selling Tools > Website Preferences. Enable auto return, and enter the return URL as http://yoursite.com/checkout/order-received/ (replacing yoursite.com with your site’s address), then enable PDT. Copy your identity token to your settings under WooCommerce > Settings > Checkout > Paypal. This will allow payments to be verified without the need for PayPal IPN. No, this feature was removed in WooCommerce 3.0. Most definitely! 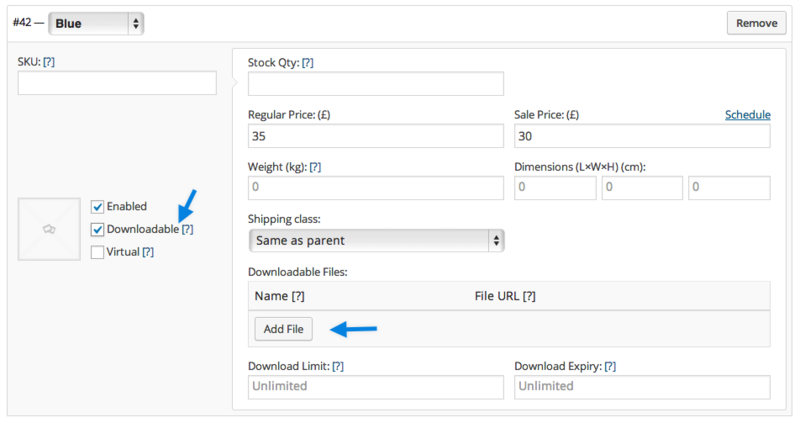 WooCommerce only needs an external URL that points to your digital download file. If it is a valid external download URL, then WooCommerce works perfectly. There is no further validation. It’s possible to do this with Product Bundles (separate purchase). A use case at Create Downloadable Item Packages shows you how. WooCommerce allows for the same file extensions defined by WordPress. You can see the full list via WordPress Codex: Uploading Files. What happens if I edit a downloadable product’s files after customers have purchased? Why does WooCommerce link to the URL of the file? Why don’t I see a file link on the order received page? Do old orders get access to new downloads after a product is edited? Can I use cloud storage to store my files and downloads? How do I create an album of song downloads to sell music? What file extensions can I use?